Listen. I love to rock white. 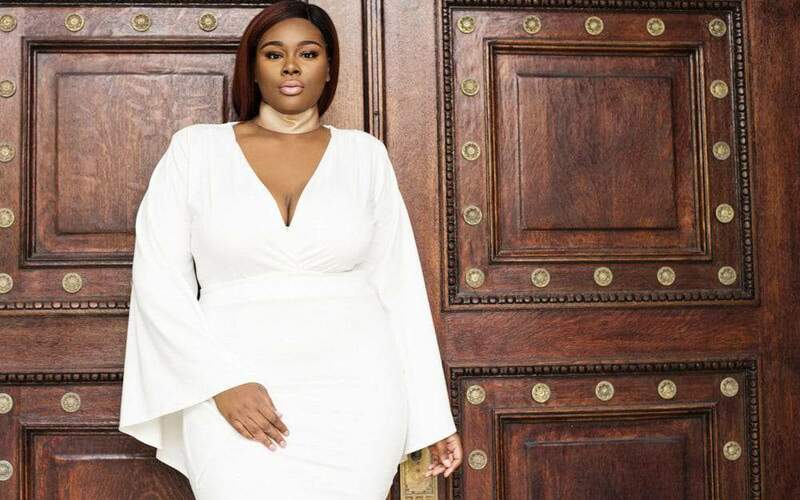 As a plus size woman, I do not let my size dictate what I can and cannot wear, but I do know that wearing white does make me feel like a badass. I feel chic, sophisticated, modern, and like a rule breaker! So when I saw the newest Pop Up Plus White Lookbook in my inbox, I knew that I had to share with you the latest ways to rock white! Pop Up Plus is no stranger to the blog! Known for their amazing look books, on trend options, and great styling, they have been carving out their space and making their name known for quite some time! They push and challenge stereotypes and rules and today, is no exception with their look book dedicated to wearing white! Every day it’s a daily fight – fending off online “trolls” when we post photos of our models or customers in #popupplus. It still seems after all the messages of body confidence, there is a segment of society that has a hard time embracing the idea that curvy girls have a right to wear what they want to wear. They want us to tell plus size girls to cover up and hide but there is nothing greater than encouraging our customers to look and feel great at ANY size. YES! And with that, please let me share with you the latest lookbook from Pop Up Plus! Tell me that wasn’t hot! I mean DAMN. Right? I need the Pants Jumpsuit, the off the shoulder maxi dress, the strapless midi peplum dress, and maybe even that romper! Ha! Yeah, I need all of those. I maybe even do a little video about my obsession! And you can shop the collection NOW, at PopUPlusOnline.com! Pop Up Plus purposely hand picks pieces, colors, trends and any other garment or item that falls into the “Curvy Girls Can’t Wear” category. It is their mission to “push our customer outside of her box and her own limitations.” One that I am all the way here for! What do you think of the collection and lookbook? Are you a fan of rocking white? Let me know what you think! SHOP THIS! 10 Pieces You Need To Update Your Summer Wardrobe! You know, it is tough for a woman who is not necessarily curvy, but not skinny or slim to pull off white at times. It seems to increase the visibility of my flaws and things about me that I find less than great to look at. No matter how hard i try, I am wearing something that shouldn’t be on it. I love white clothes, but I guess not for me. Depending on the dress and how much I love it. Very cute. I love how these pieces break the rules and shows off the curves vs the flowy bohemian gauzy, dresses. Nothing against those styles, but on me, they make me appear larger than I actually am. Love wearing white, hate trying to keep it clean. If I buy white, I try to get pieces made with fabric that dyes easy, that way I can rock white a few times & dye it when it gets dinghy. Then I get to choose any color I like. Tempa Shirley Lipps sooooo smart! Can someone tell me what type of dress for i have a fat apron and adominal bloating i was thinking empire waist with a flowing bottom? Thank you anything to wear under to hold apron in some it is down to my thigh on the left side only..
Look #3 would look stunning for the summer in our silver heart pendant necklace pendant from Chic24Hours!